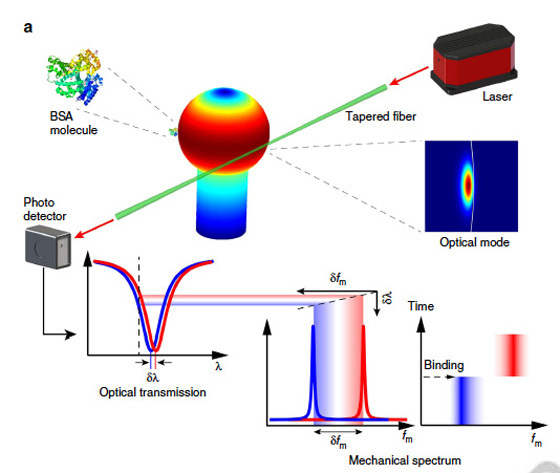 A team of engineering researchers from the University of Rochester and the University of Victoria has developed a way to detect single molecules with an optical technology that uses a spring force produced by light circulating in a miniaturized resonator. The new technology, described in a study published in Nature Communications, has many potential applications, including medical diagnostics, drug development, security screening, and environmental science. The circulating light produces a force that makes the miniaturized resonator vibrate in a periodic fashion. When a particle or biomolecule lands on such a vibrating resonator, the so-called “optical spring” effect changes the vibration in a particular way that significantly enhances the detection of particles and molecules. “This is the first time the sensing capability of the optical spring force has been realized, although the optical spring effect has been known for more than a decade,” says coauthor Wei Jiang, a Rochester doctoral student in optics. 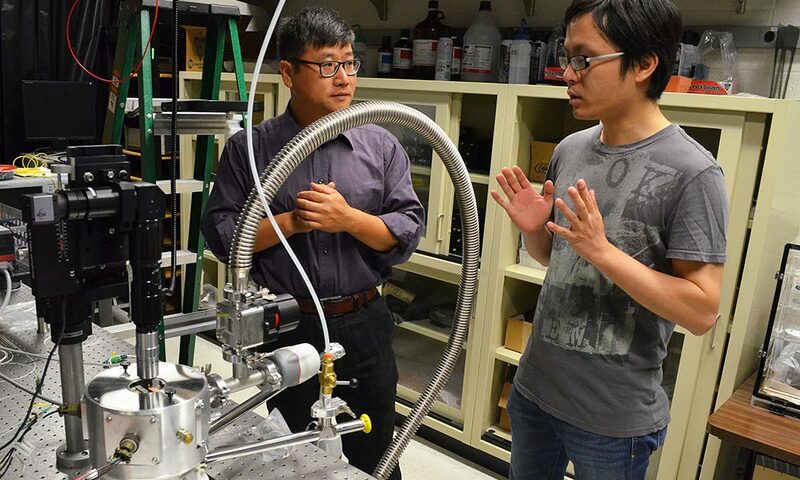 The team also includes Qiang Lin, assistant professor of electrical and computer engineering at Rochester, and doctoral student Wenyan Lu and assistant professor Tao Lu at Victoria. The optical resonator used by the team – a whispering gallery micro-resonator — was inspired by the acoustic “whispering gallery” effect first discovered in London’s iconic St. Paul’s Cathedral, where a voice whispered against one wall travels around the chamber’s circular rim and is clearly audible over 40 meters away on the other side.. The team’s micro-resonator – which uses light instead — is only about 100 microns in diameter, about the width of a human hair. The American Institute for Manufacturing Integrated Photonics (AIM Photonics), announced last year, will be headquartered in Rochester, and will bring the nation’s leading talent from companies, universities, and federal research institutions together under one entity to develop the next generation of integrated photonics. The work represented in the paper is supported by the National Science Foundation, the Defense Advanced Research Projects Agency, and the National Sciences and Engineering Research Council of Canada. This drawing illustrates the sensing mechanism used by researchers at the universities of Rochester and Victoria, in which an ‘optical spring’ effect enhances the detection of particles and molecules.